What are the Roth IRA rollover rules? When can you perform a rollover? And how long do you have to do it? You need to know every iota of the law if you plan to perform a Roth IRA rollover, because if you perform one incorrectly, you face the prospect of unforeseen tax bills, possible penalties, and even years of pain, frustration, and inconvenience. Once you understand the Roth IRA rules for each of these topics, then you've successfully laid the groundwork for your Roth IRA rollover. So let's examine each rule on an individual basis. Before you can perform a rollover, you need to make sure you're eligible. Under the Roth IRA rollover rules, you're ineligible to perform a Roth IRA rollover if you inherited the account you're rolling over from someone other than your spouse. In such cases, inherited accounts can NOT be rolled over in your Roth IRA. For instance, let's say you're 75 years old and your Traditional IRA has a total net value of $200,000. You and your spouse die in a car crash, and your daughter (an only child) inherits your entire estate. Can your daughter rollover your Traditional IRA into her Roth IRA? Because under the Roth IRA rollover rules, you're ineligible to perform a Roth rollover with an inherited account from someone other than your spouse. But what if only you die in the car crash, and your spouse lives? In that case, your spouse can elect to treat your Traditional IRA as her own and roll it over into a Roth IRA. Of course, before you can perform a Roth IRA rollover, you need to have an account to receive the rollover funds. As a result, the Roth IRA rollover rules require you to have a previously existing Roth IRA account before you can perform a rollover. For instance, let's say you have a Traditional IRA with Charles Schwab, and you want to perform a rollover to a Roth IRA with eTrade. In order to do so, you need to have established open account with eTrade before you initiate the rollover. Otherwise, the funds have no where to go. However, you can get around this provision without performing a rollover, but another method Roth IRA conversion - "same trustee transfer." For example, say you have your Traditional IRA with Charles Schwab, you want to convert to a Roth IRA. If you perform your conversion with the same broker (in this case, Charles Schwab), then you can perform a same trustee transfer, which simply redesignates your existing account from "Traditional IRA" to "Roth IRA." Of course, you'll still owe any applicable taxes just as if you had performed a rollover from one account to another, but it can be a method for simplifying the process. In past years, the IRS imposed a $100,000 income limit on Roth IRA conversions, meaning if your adjustable gross income (AGI) exceeded $100,000, you were prohibited from performing a rollover. But under the new Roth IRA rollover rules, anyone can perform a Roth IRA conversion regardless of income. This rule change has opened the door for high income earners to make Roth IRA contributions, in some cases for the first time. Well, each year the IRS establishes Roth IRA income limits, and if you earn more than the upper limit, you're barred from making a direct contribution to your Roth IRA. Since anyone, regardless of income, can make non-deductible contributions to a Traditional IRA, you can contribute the maximum amount to your Traditional IRA, then perform a Roth IRA rollover - effectively making a Roth IRA contribution since the non-deductible contributions are not subject to income and you haven't had a chance to generate taxable earnings yet. One notable provision of the Roth IRA rollover rules is the Roth IRA 60 day rollover rule. Under the 60 day rule, you have exactly sixty calendar days to rollover (contribute) funds from your 401k or Traditional IRA to your Roth IRA. If you take a rollover distribution from your 401k or Traditional IRA, but you fail to contribute that distribution to your Roth IRA within the 60 day window, in all likelihood, you'll owe a 10% early withdrawal penalty and you'll lose the ability to contribute those funds to your Roth IRA forever! You can still make regular Roth IRA contributions, but in missing the 60 day window, your botched rollover effectively becomes indistinguishable from a regular distribution. For example, let's say you're 42 years old and have $40,000 in your 401k, and you leave your job. You then decide to perform a Roth IRA conversion by rolling your 401k funds into your Roth IRA. In initiating your rollover, your previous employer strikes you a check on April 5th for $32,000 (holding 20% back for tax purposes). It's now up to you to complete the Roth IRA rollover. And under the Roth IRA rollover rules you have 60 calendar days to deposit those funds in your Roth IRA or the rollover fails. So if you procrastinate and deposit the funds in your checking account, but put off moving them into your Roth IRA until June 10th, what happens? The rollover fails because you missed the 60 day window for rolling the funds into your Roth IRA. As a result, not only do you owe applicable income taxes (which you would've owed regardless), but you also owe a 10% early withdrawal penalty on the $40,000 distribution from your 401k because you're not yet age 59 ½ and its considered an early withdrawal. You missed your opportunity to put those funds in your Roth IRA where they would grow tax-free until your retirement years. Now those funds are outside both your Roth IRA and your 401k - unable to take advantage of the tax-efficient growth both accounts offer. If you take a direct rollover distribution, deposit those funds in your Roth IRA as soon as possible. Do not procrastinate! Better yet, skip the rollover and perform a direct trustee-to-trustee transfer or a same trustee transfer so the converted funds go directly into your Roth IRA, then you don't have to worry. Taxation of distributions is treated differently under the Roth IRA rollover rules. For instance, regardless of whether or not you're age 59 ½, the 10% early withdrawal penalty is waived for Roth IRA rollovers. Nevertheless, you still owe income taxes on any tax deductible contributions and any investment gains which are being rolled over. For example, let's say you have $40,000 in your Traditional IRA, and you're in the 25% tax bracket. Assuming you funded your Traditional IRA with pre-tax dollars (tax deductible contributions), performing a Roth IRA rollover generates a $10,000 income tax bill ($40,000 x 25%). And that reminds me of an important point. How do you plan on paying that $10,000 tax bill? If you have an extra $10,000 laying around, that's great! But most people don't. Were you planning on paying the $10,000 tax bill with funds from the rollover? If so, keep in mind that any funds NOT rolled over into your Roth IRA are subject to a 10% early withdrawal penalty if you're under age 59 ½. For example, let's say you're 55 years old with $100,000 in your Traditional IRA, and you're in the 28% tax bracket. Under the Roth IRA rollover rules, if you perform a rollover to a Roth IRA, you'll trigger an income tax liability of $28,000 ($100,000 x 28%). But you can't just send the IRS a check for $28,000 and deposit the remaining $72,000 in your Roth IRA. Because since you're under age 59 ½, you owe a 10% early withdrawal penalty on the $28,000 you withdrew to pay your income tax bill. That means you really owe the IRS $30,800, not $28,000. And what happens if you don't have an extra $2,800 to pay the 10% penalty? Can you pay that with rollover funds too? Well, consider the implications if you do use your rollover funds to pay the $30,800 tax bill. Under the Roth IRA rollover rules, you then need recalculate the 10% early withdrawal penalty because now you're taking an early distribution of $30,800, not $28,000. And what happens if you don't have the funds to pay the penalty? Do you see where this is going? The point to remember is this - rollovers usually come with income tax bills. Prepare to owe taxes on your Roth IRA rollover and have well thought out plan for paying them. It's always a good idea to seek out the advice of a certified financial professional who can guide you through the process. Money spent on reasonable fees is small potatoes compared to the peace of mind you get from doing things right the first time around! 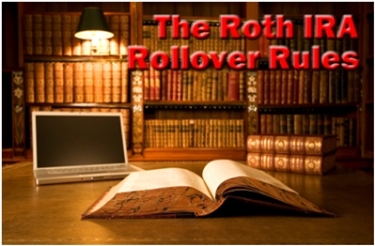 The Roth IRA rollover rules are fairly easy to understand. While the Roth IRA rollover rules are easy to understand, and the process is usually simple, it's always a good idea to seek professional help when performing a Roth IRA rollover. The last thing you want is a failed rollover or unexpected taxes and/or penalties. With professional guidance, you get peace of mind knowing your rollover is handled correctly.